I’ve been sitting back over recent months wondering when the Turkish archaeological site of Göbekli Tepe might receive more mainstream press attention. Finally, Archaeology Magazine has done somewhat of a feature on this fascinating site, although it’s still fairly light on information. It does, though, have some excellent images of the carvings on the megaliths. (For the Google Earth/World Atlas users out there, you can find the site at 37.223300N, 38.922400E, and there are also photos accessible through the Google Earth interface). The reason I’ve been waiting for more hype is that Göbekli Tepe is a megalithic site (with actual ‘stone circles’) which predates both Stonehenge and the pyramids of Egypt by at least 7000 years – and has been known about since 1994! Stonehenge and the Great Pyramid both have construction dates around the 3rd millennium BCE (although Stonehenge had many stages of building). The construction of the megaliths (most around 2 to 3 metres high) at Göbekli Tepe has been dated to 10,000BCE. This raises some serious questions about currently accepted theories regarding early Neolithic peoples, from their religious and social practices through to their technical and artistic abilities. In contrast, Nabta Playa seemed to get far more media attention in the wake of its discovery. The really strange thing is that in 8,000BC, during the shift to agriculture, Gobekli Tepe was buried. I mean deliberately – not in a mudslide. For some reason the hunters, or the ex-hunters, decided to entomb the entire site in soil. The earth we are removing from the stones was put here by man himself: all these hills are artificial. Looking at the Google Earth imagery of the site, it seems likely that there are still many more significant discoveries awaiting excavation of the area. And it’s a good lesson in what may also be awaiting discovery in other other places, such as under the sands of Egypt and in flooded ocean areas of the late Ice Age. The second interesting point Thomas reveals in his article is that archaeologists found a 9 metre megalith in situ at the quarry, which apparently broke during excavation and so was not used. 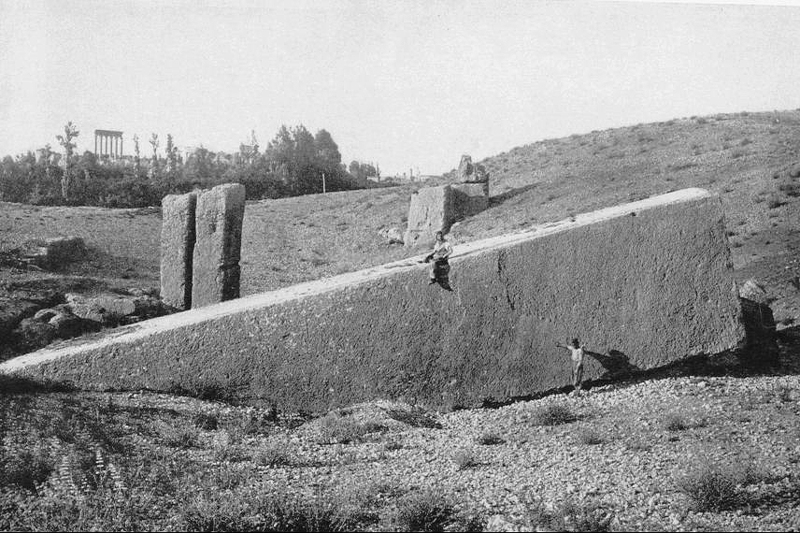 That may not quite rival the ‘Stone of the South’ at Baalbek, but that’s still a massive undertaking, especially in the supposedly primitive time of 10,000BCE. Remember when Robert Schoch was shouted down by the ‘orthodoxy’ about his age of the Sphinx argument, because there were no precedents to construction on that scale before 3000BCE? In fact, Göbekli Tepe sounds like it would have been front and centre in Graham Hancock’s Fingerprints of the Gods, if it had been discovered at the time of writing. The interesting question is – where are the other traces of megalithic culture from the 8000 to 3000BCE period? Hopefully we’ll start hearing more and more about this fascinating archaeological dig in the mainstream media soon (though no doubt they’ll all play on the ‘Garden of Eden’ aspect rather than concentrate on the mystery of the site’s construction date). Wonderful capsule summary of developments, Greg—thanks much for this. Thanks for posting this Greg, it’s awe inspiring. Quick impression: I’m looking at the three center pictures. The left looks like a boar as described, but it has sharp teeth and multiple toed feet, not cloven hooves. That’s one strange, scary looking boar! The middle photo is definitely not a “crocodile-like creature”, it looks like a big cat — where do these people get a crocodile from, seriously? It’s definitely a cat. The third picture is the most interesting, and no mention has been made that the main vulture is balancing a ball on one wing! The sun? If so, it could be a precursor to the winged solar disc. Makes me wish I could be there in person to look at them up close. Turkey seems to have many surprises that don’t fit the orthodox timeline. Catal Huyuk, and now this. The Daily Grail comes up trumps yet again. It is always fascinating when these things finally get serious discussion. I heard some little things about this site a few years ago, but nothing specific. Is there some coincidence in time between the drowning of the coastal areas of the Black Sea, and the destruction (or the construction) of these sites? Yes I know this is the flood again and the garden of eden stuff. I am mixing these things up. Geologists Walter Pittman and William Ryan have shown that the Black Sea flooded circa 5000 BC, which would have forced coastal communities into the mountains. Read more. This flood described by Pittman and Ryan occurred at least 5000 years after the construction of Gobekli Tepe. But my point is considering how devastating the Black Sea flood was circa 5000BC, imagine how cataclysmic the floods were 12000 years ago when the ice melted — and Gobekli Tepe was built shortly after the end of the Ice Age. intentional burial — as in the usual destruction by invaders? Invaders FROM the Garden of Eden? The Real garden of Eden is the Congo — where the Pygmies live.